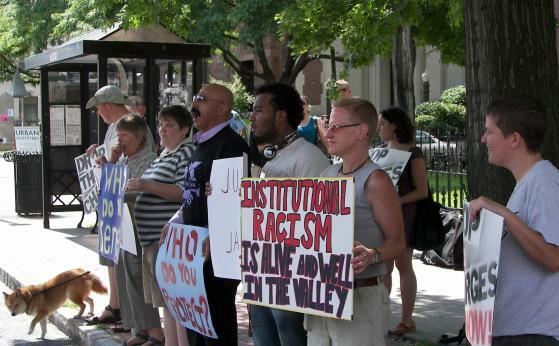 A rally for Jason Vassell was held on August 6 in Northampton following an evidentiary hearing related to a Motion to Dismiss filed by Vassell’s attorneys at the county courthouse there. The former UMass student was involved in an altercation with two non-UMass students in the Southwest dormitory complex on February 3, 2008. The rally was in support of the motion filed on Vassell’s behalf and to hear further information regarding recent court finagling over the defense’s discovery process. 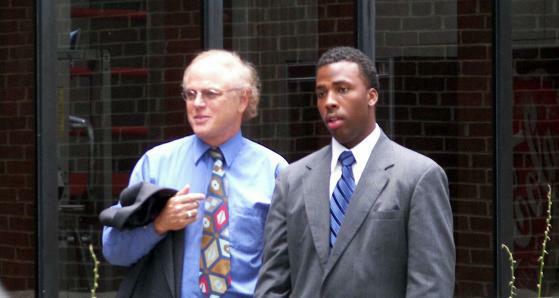 On February 3, 2008, Jason Vassell and two female friends were in his ground-floor dormitory room in the Southwest complexes on the UMass campus when two non-UMass students, John Bowes and Jonathan Bosse, both of Milton, Mass., allegedly began harassing Vassell using racial epithets. Bosse and Bowes had both been drinking alcohol at an earlier off-campus party, and the confrontation escalated as Vassell told the two men to leave and reportedly closed his window blind. Shortly after Vassell closed the window blind, one of the two men allegedly broke Vassell’s dormitory window. After calling a friend, Vassell went to the entrance of the dormitory to let his friend in when Bosse and Bowes entered the lobby of the building. A fight ensued, and in the melee Vassell’s nose was broken. At some point during the altercation Vassell used a pocketknife and struck the two men with it before retreating behind a locked door. Because of the nature of the events and response by police officers, a “grassroots campaign for racial justice” was started shortly after the events transpired. Called the Committee for Justice for Jason www.justiceforjason.org the stated goal of this campaign is to see all charges against Vassell dropped due to the alleged racial tone of the initial confrontation, and the possible profiling implications by the UMPD. Kate Traub, one of the organizers of the event, told the Valley Post that the organization was started because friends and students who knew Jason “wanted to know ‘what can we do?’” Justice for Jason has organized a rally at every hearing regarding this case and has also organized community study groups to discuss questions of bias in the prosecution and sentencing of minorities in the commonwealth and numerous other informational events. Further information on these and other events can be found on the Justice for Jason website. Supporters leveled criticisms at the legal system in general, and supported a long-term commitment to Vassell’s attempt to get the case dismissed. “Until the charges are dropped there will be people out supporting Jason,” Natalia Tylium, another rally participant, told the Valley Post. “Unfortunately [this case] lays bare the racism inherent in the justice system in this country.” The systemic criticism of both the police and legal system by the rally participants shares a rationale with the defense’s argument; the Motion to Dismiss is founded largely on the alleged racial bias of the police response and the racial tone of the violent confrontation. Currently, Vassell faces up to 30 years in prison if convicted on two counts of aggravated assault and battery with a dangerous weapon. John Bowes was convicted of misdemeanor disorderly conduct charges in March of this year related to his actions outside of Vassell’s window. Jonathan Bosse was never charged for his role in the altercation. Darren Lone Fight can be reached at darrenlonefight@gmail.com. Please put “Valley Post” in the subject line.